I am very excited to announce our new review paper which is out now in Front Cell Dev Biol [Link]. This is also the first paper from Dr Kamila Marzec who recently joined the lab. Great work! MASTL kinase is a master regulator of mitosis, essential for ensuring that mitotic substrate phosphorylation is correctly maintained. It achieves this through the phosphorylation of alpha-endosulfine and subsequent inhibition of the tumour suppressor PP2A-B55 phosphatase. In recent years MASTL has also emerged as a novel oncogenic kinase that is upregulated in a number of cancer types, correlating with chromosome instability and poor patient survival. While the chromosome instability is likely directly linked to MASTL’s control of mitotic phosphorylation, several new studies indicated that MASTL has additional effects outside of mitosis and beyond regulation of PP2A-B55. These include control of normal DNA replication timing, and regulation of AKT/mTOR and Wnt/β-catenin oncogenic kinase signalling. 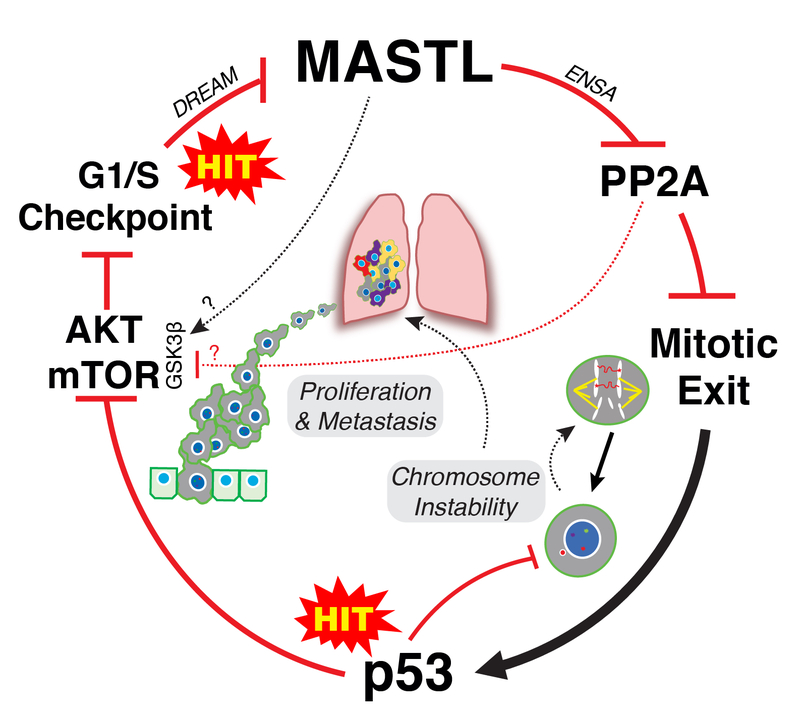 In this review, we will examine the phenotypes and mechanisms for how MASTL, ENSA and PP2A-B55 deregulation drives tumour progression and metastasis. Finally, we will explore the rationale for the future development of MASTL inhibitors as new cancer therapeutics. This entry was posted in News and tagged breast cancer, Cancer, Cell cycle, chromosomal instability, CIN, DNA replication, MASTL, Mitosis, phosphatase, PP2A, TNBC, TP53. New Co-Author Publication! Ensa controls S-phase length by modulating Treslin levels. Great news, we have published a co-authored paper entitled ‘Ensa controls S-phase length by modulating Treslin levels’ in the prestigious journal ‘Nature Communications’. This work was started back in 2011 when I was a Post-Doc in the laboratory of Anna Castro in France. It’s exciting to see those inital discoveries transition into the finished paper. The Greatwall/Ensa/PP2A-B55 pathway is essential for controlling mitotic substrate phos- phorylation and mitotic entry. Here, we investigate the effect of the knockdown of the Gwl substrate, Ensa, in human cells. Unexpectedly, Ensa knockdown promotes a dramatic extension of S phase associated with a lowered density of replication forks. 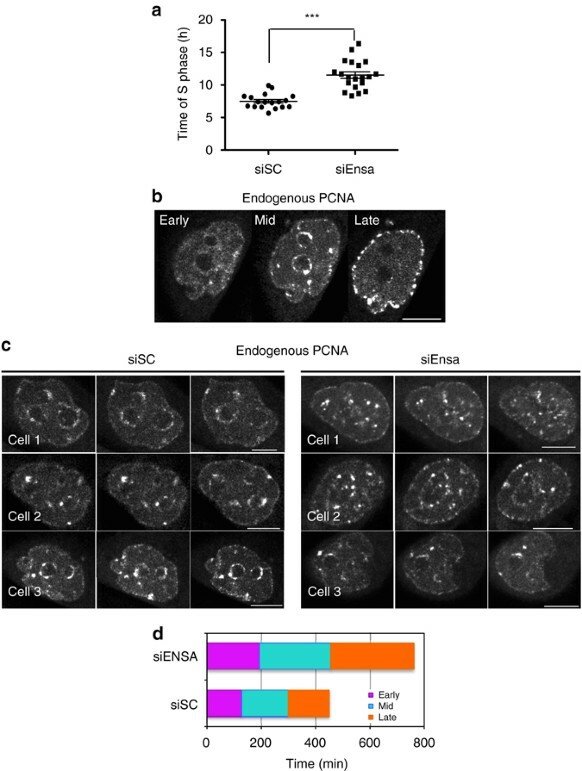 Notably, Ensa depletion results in a decrease of Treslin levels, a pivotal protein for the firing of replication origins. Accordingly, the extended S phase in Ensa-depleted cells is completely rescued by the overexpression of Treslin. Our data herein reveal a new mechanism by which normal cells regulate S-phase duration by controlling the ubiquitin-proteasome degradation of Treslin in a Gwl/Ensa-dependent pathway. This entry was posted in News and tagged Cell cycle, DNA replication, ENSA, Greatwall, MASTL. A defining feature in over 2/3rds of all solid tumours is the continual loss and gain of whole are small parts of chromosomes. This instability, or CIN for short, strongly implicated in tumour initiation, progression, chemoresistance and poor prognosis. CIN is created through failures during mitosis, whereby whole or parts of a chromosome are segregated incorrectly, thereby created daughter cells with unequal chromosome numbers. Consequently, understanding how mitosis is regulated is essential for uncovering the mechanisms allowing CIN to arise and drive cancer. In our recent publication, we discovered the mechanisms controlling the key regulatory pathway critical to ensuring cells exit mitosis correctly. At the centre of this pathway is a gene call MASTL (short for ‘Microtubule Associated Serine/Threonine Kinase-Like’). The primary function of MASTL is to ensure that the cellular breaks (the phosphatase PP2A), is turned off during mitosis so that the accelerator (Cdk1 kinase) can drive the cell into mitosis. Much like a car, having the accelerator and breaks on at the same time is a bad idea, unless you like the smell of burning rubber. To successfully exit mitosis, and to perfectly segregate chromosomes, the cell must take the foot off the accelerator and turn on the breaks. Because MASTL is the central regulator ensuring the breaks are coordinated with the accelerator, it is essential to understand how MASTL is controlled. To this end, we uncovered that MASTL must be rapidly turned off to allow cells to exit mitosis, and this inactivation is carried out by another cellular brake call PP1 phosphatase (Rogers et al, JCS 2016). Now that we have identified and mapped this novel mitotic exit switch, we hope to be able to shed new light on how CIN drives the initiation and evolution cancer. We believe that with further study we will be able to better predict patient response to chemotherapy, and also identify new ways to ‘switch off’ highly unstable tumours, thereby improving treatment for patients that currently have a very poor prognosis. Image of Interphase HeLa cell stained for Actin (red), DNA (blue) and the co-localisation of MASTL and PP1 by Proximity Ligation Assay (PLA; green). This entry was posted in News and tagged anaphase, bistability, Bitplane, Cancer, Cdk1, Cell cycle, cell division, chromosome bridge, chromosome instability, CIN, evolution, Garvan, Greatwall, kinase, Kinghorn Cancer Center, MASTL, Mitosis, mitotic exit, phosphatase, phosphorylation, PLA assay, PP1, PP2A.